No Room For Wishing is a one-man documentary play about how big picture politics affect our everyday lives, and what happens when people come together to try to force change. 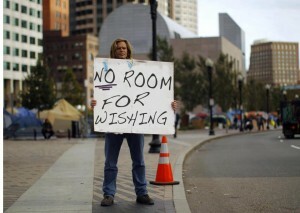 Compiled entirely from the exact words of people involved in and affected by the Occupy movement in Boston in the fall of 2011, No Room For Wishing is a complex, disturbing, and inspiring look at how human beings succeed and fail in building relationships, social structures, and governance. One of Boston’s most dynamic young theatre makers portrays over thirty characters in this 90-minute up-close-and-personal encounter with our nation and ourselves. Written and performed by Danny Bryck and directed by Megan Sandberg-Zakian, with sound design by Benjamin Scheff and featuring original music by Miles Disney and Ruby Rose Fox. Thanks to the support of over 150 donors, No Room for Wishing had a dynamic collaborative world premiere in the Boston area in the fall of 2012, co-produced by Company One, Central Square Theater and Boston Playwrights’ Theatre, and has since toured New York and Massachusetts, including performances at Theater at St. Clement’s and the Outside the Box Festival. It was nominated for Best New Play and Best Solo Performance by the Independent Reviewers of New England. Bring No Room for Wishing to your venue or school. If you’re interested in hosting or producing No Room for Wishing, click here for technical requirements and more information. Performed No Room for Wishing and taught a workshop for students at Worcester State University. No Room for Wishing performed at the opening weekend of the Outside the Box Festival on the Boston Common, in the American Repertory Theater’s Spiegeltent. Today the house was full and we had an incredible conversation after the show. Very grateful to everyone who made this festival happen, and honored to perform the show on the Boston Common, where it all started. No Room for Wishing was nominated for Best New Play and Best Solo at a Small Theatre at the 2013 Independent Reviewers of New England (IRNE) Awards. I was also honored by Company One with the David Wheeler Award for emerging talent in the Boston theatre scene. No Room for Wishing toured to my hometown of Amherst, Mass. Held a pay-what-you-can performance at the Jones Library at 43 Amity Street in downtown Amherst, with a wonderful post-show discussion. Returned to the Community Church of Boston last night for another pay-what-you-can encore performance of No Room for Wishing. The show followed a community gathering with food provided by the Occupy Boston Food Working Group at 6pm, and a wine reception followed the performance. Blankets and tarps were accepted for the houseless at the door. A great night! No Room for Wishing made its New York City debut this past Monday, October 22nd at Theatre at St. Clement’s in midtown, on 46th St. between 9th and 10th. Many thanks to Peccadillo Theater Company and to Richard Cohen for making this performance possible. Lots of old friends and new. Wine and cheese reception after the show, followed by an afterparty at JIMMY at the James Hotel featuring Boston singer/songwriter Ruby Rose Fox, whose song “Dewey Square” is featured in No Room for Wishing and inspired the title. A really profound night at the Community Church of Boston this past Friday, October 19 for an audience including many Occupiers, many of whom are represented in the play. Great discussion afterwards. No Room for Wishing has officially closed its world premiere, co-produced by Company One, Central Square Theater and Boston Playwrights’ Theatre, after a nearly sold-out run in Central Square. Thank you to everyone who made this production possible and everyone who came to share it with us. Our first weekend has been great and our audiences have been wonderful. It has been really enlightening and encouraging to hear people’s responses during our post-show discussions, moderated by our excellent facilitation team! Please come join us! Also, check out the fascinating content that our dramaturg Phil Berman has put up on Company One’s blog. Thank you to everyone who gave for your generosity. If you’re still interested in supporting the project, email me to find out how. Click here to see the kickstarter page. Rehearsals for the world premiere have begun! It’s great to be in the room with Megan, our stage managers Jennifer Howard and and Kelsey Hodgins, and dramaturg extraordinaire (and fellow BU alum) Phil Berman! Check out the dramaturgy blog! Recently got back from New York where I performed an excerpt of the show at “Jubilee: A Festival of New Playwrighting” at 9BC Performance in La Plaza Cultural, a beautiful community garden in Alphabet City, on Sunday August 26. 9BC Performance is a network fostering artistic collaboration in the East Village, and they have been putting on outdoor performance festivals all summer. Thanks to Eli Epstein-Deutsch and all the fantastic performers! No Room for Wishing was given a one-night only workshop production in Central Square Theater’s Studio Theater on June 29 at 8pm, directed by Megan Sandberg-Zakian, with sound design by Sam Sewell. The house was full and included a number of people whose voices are featured in the play, making for a fascinating talkback. Thanks to all who attended. In addition to a few private performances in July, I also had the pleasure of performing excerpts of the show on June 20 at HallSpace in Dorchester, as part of Anne Loyer’s Icons exhibition, along with excerpts from Waiting for Gilgamesh by Amir Al-Azraki. We had a fascinating post-show discussion following the readings. Thanks to Fort Point Theatre Channel for putting together this event. Performed No Room for Wishing as a staged reading at Apollinaire Theatre in Chelsea, MA on Sunday, April 15, and at Wall Street to Main Street, a two-month-long festival of Occupy-related art and performance in Catskill, NY on Sunday May 27 at 2pm. 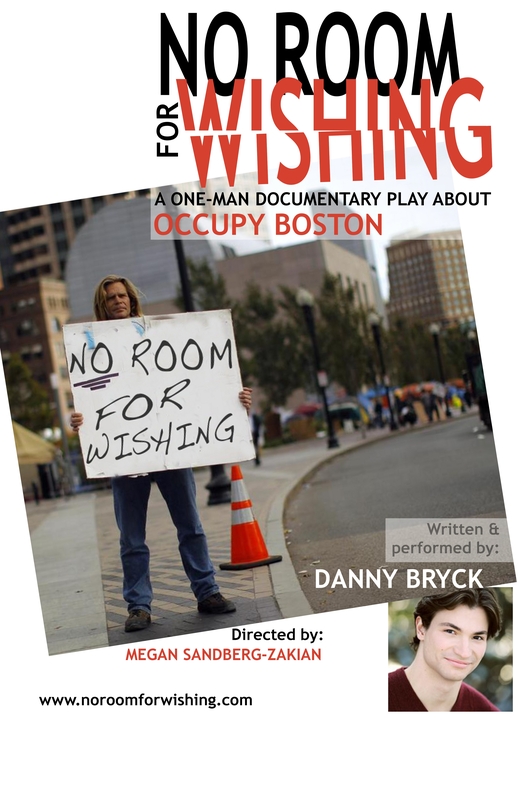 Listen to an interview here on the Occupy Boston Radio show “THE BRIDGE – Arts for the 99%” about the process behind No Room for Wishing. Also check out Occupy Your Mind, a grassroots online theatre project brought to you by The Civilians, dedicated to collecting the living history of the Occupy movement through interviews and live performances shared online. I shared a performance of one monologue from No Room for Wishing for Occupy Your Mind, originally performed at Whistler in the Dark’s event Close Up: An Evening of Theatre. Watch the video here.